Alcatraz closed decades ago, but trouble still seems to resurface around the penitentiary for San Francisco Detective Madsen, Alcatraz expert 'Doc' Soto and the mysterious agent Emerson Hauser. Featuring brand-new extras including a behind-the-scenes featurette, unaired scenes, a gag reel and all 13 episodes of the thrilling series. Brand-New Extras Include Behind-the-Scenes Featurette, Unaired Scenes and Gag Reel! BURBANK, CA (August 8, 2012) - Alcatraz closed decades ago, but trouble still seems to resurface around the penitentiary for San Francisco Detective Madsen, Alcatraz expert "Doc" Soto and the mysterious agent Emerson Hauser. In Alcatraz: The Complete Series , Warner Home Video (WHV) brings fans all of the action and suspense from the series that attracted more than 6.7 million viewers per episode and a Critics' Choice Television Award nomination for "Most Exciting New Series." 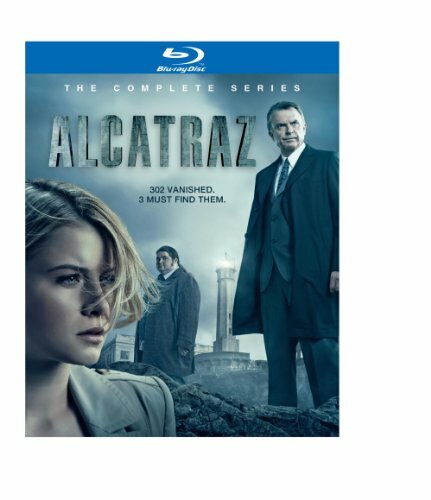 Featuring brand-new extras including a behind-the-scenes featurette, unaired scenes, a gag reel and all 13 episodes of the thrilling series, Alcatraz: The Complete Series will be available for the first time on DVD and Blu-rayTM October 16, 2012 for $39.98/$49.99 SRP. Alcatraz: The Complete Series chronicles the mystery of the "63s" -- the forgotten prisoners - who mysteriously disappeared from Alcatraz Island Federal Penitentiary in 1963. Now, unexplainably, these criminals are returning to the streets of San Francisco to repeat their grisly crimes - not a day older than when they initially disappeared almost fifty years ago. Enlisted by the close-to-the-vest Emerson Hauser (Sam Neill) and his equally elusive associate Lucy Bannerjee (Parminder Nagra), the driven detective Madsen (Sarah Jones) and fresh-faced Diego "Doc" Soto (Jorge Garcia) delve into the mystery of the 63s return, uncovering a much larger, more sinister threat. The series also features Robert Forster, Jonny Coyne and Jason Butler Harner as the prison's authority with a shared histoy. "Warner Home Video is thrilled to release the mysterious, thrilling, and action-packed Alcatraz: The Complete Series on DVD and Blu-rayTM," said Rosemary Markson, WHV Senior Vice President, TV and Special Interest Marketing. "With all 13 episodes of the series plus behind-the scenes extras, this set is perfect for fans who are eager to watch the entire must-see drama." Executive produced by J.J. Abrams (Fringe, Lost, Alias), Bryan Burk (Star Trek, Fringe), Elizabeth Sarnoff (Lost, Deadwood), Jack Bender (Lost, The Sopranos), Jennifer Johnson (Cold Case) and Daniel Pyne (The Sum of All Fears), Alcatraz: The Complete Series stars Sarah Jones (Big Love, Justified, Sons of Anarchy), Jorge Garcia (Lost), Jonny Coyne (Sharpe's Peril), Parminder Nagra (ER), Jason Butler Harner (Changeling, The Good Shepherd) and Sam Neill (Jurassic Park, The Tudors). The series is produced by Bonanza Productions Inc. in association with Bad Robot Productions and Warner Bros. Television. Alcatraz: The Complete Series Blu-ray will be released in 1080p Full HD Video and will feature DTS-HD Master Audio for English 5.1. The Blu-rayTM release also includes an UltraVioletTM copy of all 13 episodes from the series. UltraVioletTM allows consumers to download and instantly stream the episodes to many computers, tablets, and smartphones. * The Allure of Alcatraz (featurette): Fans will discover what attracted the creators to this island. The cast members will also discuss their roles and share their memories of working on Alcatraz. Finally, the art department reveals the efforts behind re-animating the mood, tone, and mystery of this iconic landmark.